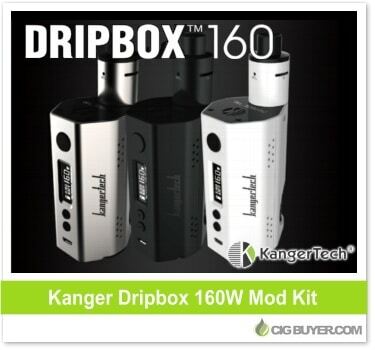 Unlike anything else on the market, the Kanger Dripbox 160W Mod is actually a larger, more powerful version of the original Dripbox Mod. This unique “squonker-style” device simplifies dripping by incorporating a 7ml squeeze chamber that pushes liquid through the included Subdrip RDA and directly into the coil. Powered by dual 18650 batteries, this version is larger, offers more power (up to 160W) and includes temperature control. Rebuild the RDA yourself or use Kanger’s pre-built drip coils – available in kanthal (0.2 ohm) or ceramic (0.25 ohm).